Could Baloch Freedom Charter Do More Harm than Good? Over the past year, Baloch nationalists and their supporters have been working to develop a Freedom Charterwhich articulates the legal grounds for an independent Baloch state. Using social media, email, and private consultations, the drafters have sought to extend the revolutionary spirit of the Arab Spring to Baloch lands in Afghanistan, Iran, and Pakistan. Claiming to have received significant feedback from the Baloch community, some North American supporters of Baloch independence suggest that the draft is now ready to be finalized. However, vocal American supporters of Baloch independence believe that the finalization of the Freedom Charter should not proceed. Andrew Eiva, a Washington lobbyist associated with a number of past self-determination movements, is one of them. Eiva says that Baloch activists should abandon the Freedom Charter and instead embark on the drafting of a new document that better aligns with their tactical needs and strategic interests. Given my reporting interest in Balochistan, I sat down with Eiva to hear his long list of reasons why he favors this approach. Eiva’s concerns can be traced as far back as the origins of the draft Baloch Freedom Charter. According to the Baloch activists, the current draft Freedom Charter is derived from one originally prepared by Peter Tatchell, a British political campaigner best known for his work promoting LGBT freedom and global justice. Without criticizing Tatchell, Eiva stresses that the Freedom Charter’s non-Baloch origin should concern proponents of Baloch independence: “The drafting of the document should have started with the Baloch and then moved on to other players. This is the wrong way to do it … The American founding fathers drafted the Declaration of Independence and gave it to the American army. It became important because the soldiers began calling themselves Americans because of the document.” Given its origin, he questions whether the Freedom Charter can ever inspire the Baloch resistance to the same degree. Eiva says that the Baloch should have taken a different approach. If the document had been completely drafted and finalized by the Baloch and then circulated with foreigners, Eiva believes the average Baloch living in Southwest Asia would feel stronger ownership in the document. He also argues that the Pakistani Government would have a more difficult time dismissing the movement as yet another example of foreign meddling in Pakistani internal affairs. Such concerns cannot be easily rectified at this point in the process. Eiva’s second issue of concern is the language, length, and scope of the document. While the draft has yet to be finalized, Eiva notes that the document has grown considerably in length and scope from Tatchell’s original. Eiva bemoans the current draft, saying that“the document is too long” and “the prose is unreadable.” He attributes this in part to the decision to originally draft the document in British English rather than Baluchi. The drafters may have failed to properly establish limits in their solicitation of feedback as well. From Eiva’s perspective, the final document should strive to be no more than a few pages; emphasizing: “The founding document of Pakistan, the Lahore Resolution, is only a couple of sentences.” Given the length of the current draft (including consolidated feedback), it is difficult to see how Baloch activists can reduce the document to such an extent. When asked specifically about the draft document’s support for the legalization of drugs, Eiva admits that this could be “a major turn off for the people of India, Russia, Europe, and Iran whose populations are afflicted with hundreds of thousands of cases of addiction from South Asia heroin.” He therefore presses the Baloch to be more prudent about what they choose to put in and leave out of their founding document. Eiva’s third set of reservations are with some of the central arguments made in the draft Freedom Charter. By failing to confront these four issues, Eiva believes that the current document instead “seeks to blindside the Khan of Kalat” and a significant percentage of the population who identify themselves as traditional Baloch or devout Muslims. He bases this opinion on the fact that the charter overlooks the nearly “universal attendance” of all Baloch traditional leaders at the Quetta Jirga called by the Khan of Kalat in 2006. Eiva asserts that this could lead to widespread opposition to the document weakening Baloch support and their ability to govern. Eiva says a more pragmatic approach would prove a better course of action given that Iranian Baloch, particularly those affiliated with Jundallah, are much more fervent followers of conservative Islam than their compatriots in Pakistan. He even suggests that the Baloch in different countries should consider advancing their own freedom charters before being subsumed into the larger quest for the Baloch nation. He points out that the American revolutionaries “waited for preliminary declarations of independence in individual states” before moving forward on a joint declaration. Given these lengthy concerns, Eiva argues that the Baloch should probably just scrap the current draft altogether and rewrite it from scratch based on a less radical and more concise approach. As opposed to many of Baloch activists, Eiva is less concerned with whether the new document is a declaration of independence or merely a declaration of the right to self-determination. Eiva also reasons that the Baloch should not so overtly link their cause to Western geopolitical interests. He says Western governments, corporations, and politicians are beginning to discover the strategic value of an independent Balochistan on their own: “The Israelis have reportedly told the U.S. Government that more should be done to foment regime change in Iran. They know it is to their advantage to support groups who challenge the Iranian Government. 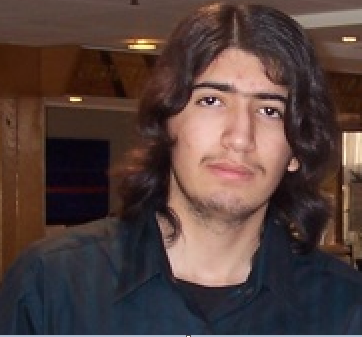 As far as I can tell, Jundallah may be the most effective resistance in Iran at least until last year.” In any event, he does not think this document is the place to make such links. The debate over Balochistan is a complex and contentious issue. I therefore encourage readers to voice their agreement or disagreement with the points raised by Eiva in the comment section below. I also welcome general comments on Baloch nationalism, including whether the Baloch should even be pursuing independence, as long as they are on-topic and tied back to the interview. Update: Peter Tatchell wrote to clarify his role in the drafting of the Baloch Freedom Charter. According to Tatchell, he first suggested the idea of the Freedom Charter at a conference of Baloch nationalists. He also helped edit/produce a standard English draft of the Freedom Charter. But, the draft itself was prepared from 12 points proposed by ethnic Baloch nationalists. In 1883, the Khan of Kalat sold the Quetta district and adjoining territories to the British government. Alongside the land, it was also an outright sale of the people, like a herd of cattle. Heirs of Khan of Kalat were also obliged to adhere to this hire purchase arrangement. He received an annual grant of Rs. 25000 for selling the most attractive part of Balochistan to the British government. Sardar Mehrulla Marri sold all mineral and petroleum rights of Khatan region to the British government in 1885 for a paltry sum of Rs. 200 per month. Again there was no time limit to this agreement, it was in perpetuity. In the same year, the British government paid Rs. 5500 to the Bugti Sardar for his cooperation although it was not specified as to what kind of cooperation he extended to the British government. Beware, my dear common poor baloch brothers and sisters. Now Gawadhar is for sale, Khan Kalat is in secret talks with Pustoon leaders. We must unite and fight these Nawabs, sardars. Baluchistan never agreed to marriage. The two houses voted for Baluchistan to remain as an independent country. Khan Yar Ahmed Khan himself has said in his writing that he did not have the authority to sign annexation. Therefore it is not a marriage, however, it is a relationship of master and slave. The slavery is maintained and aided by majority of nawab, sardars and House of Khan. Present Khan may want independence but his son the future would be khan is waving Pakistani flag. Same is true of Nawab khair bux marri (KB), KB is fighting for independence but Chengaze is waving Pakistani flag. Future of Baluch nation must be in the hand of an organisation, an organisation which is committed on a policy of independent Baluchistan. The future leader cannot be on the basis of inheritance, it has to be on the basis of election by those who are on ground zero. 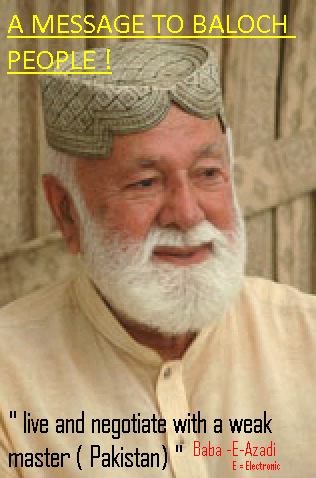 What will happen to Baluch movement once likes of Mohammad khan and Chengaze Marri take the rein of leadership? We became enslaved in 1948 because Khan, Nawabs and sardars could not see a future together, the current marriage of conveniance will not last. In 1948 the nawabs, Khan and sardars went with pakistan to protect their interest; but the ordinary Baluch struggled and today they are dictating the terms. Nawab Akbar Bugti gave his life but today Hali Bugti has joined pakistan. The future of Baluchistan cannot be left in the hand of Khan, Nawabs and Sardars, it has to be in the hand of an organisation with clear policies and clear cut constitution for Baluchistan. Constitution must ensure that all baluch have equal rights. Leaders would be elected on the basis of one man one vote. The Khan, Nawabs and Sardars want the ordinary Baluch to think that they are the vangard of baluch nation then let them prove it. Let them denounce the hereditary system handed to them by british imperialist and maintained by Pakistan and Iran. I challenge them to set an example, I challenge them to abdicate their position and their progenies (children) position as Khan, Nawab and Sardars. Such an announcement would be the declaration of freedom charter for Baluch nation. Whoever makes the announcement will gain the respect and admiration of Baloch nation and automatically will become the sole leader of Baluchistan. I will give you cast iron guarantee none of them will make the announcement, because they do not want to let go of power. The head of the paramilitary force has said that the son of a self-exiled Baloch leader has told him that he wants to bring his father back to Pakistan. Maj-Gen Ubaidullah Khan Khattak, the inspector general of the Frontier Corps, said that Prince Agha Muhammad Ahmedzai, the son of Khan of Kalat Mir Suleman Daud, expressed this desire in a recent meeting with him. “I do not want to send out a wrong message about this meeting because the Khan of Kalat is a respectable citizen of the country and we will welcome him wholeheartedly when he returns,” Maj-Gen Khattak told a news conference at the FC headquarters. “We have initiated a process of reaching out to estranged (Baloch) leaders for negotiations,” he added. The Khan of Kalat is living in self-exile in London – as do a number of other disgruntled Baloch leaders, including Balochistan Republican Party chief Barhamdagh Bugti and Hyrbyair Marri, who head outfits blamed for most violence in Balochistan. Authorities had organised a ‘Balochistan Festival’ in connection with Pakistan Day celebrations on March 23 in Quetta. The Khan of Kalat’s son was seen hoisting the country’s flag at the function along with top civil and military officials. Maj-Gen Khattak claimed that a large number of Baloch leaders turned up at the function, which shows that a majority of Baloch people wanted peace. The Khan of Kalat, however, disassociated himself from his son’s participation in the Festival. “I’ve no contact with my son for last two years,” Mir Suleman Daud told journalists in Quetta by phone from London. Mir Daudzai dispelled the impression that Prince Agha represented him at the festival. “Nobody represents me nor do I have any mouthpiece or spokesperson,” he said. “It’s an open secret that my son is under the supervision of pro-government Nawab Mir Aali Bugti,” the Khan of Kalat said. In an effort to play down the deadly insurgency, the FC chief said that the problem was not political. “The issue of Balochistan is not political but it is related to unemployment, under-development and a lack of facilities for better education,” he added. “Civil and military institutions are jointly working for the betterment of the people of Balochistan,” he said. Asked about the criticism of his force by a number of quarters, Maj-Gen Khattak said it was regrettable that they did not appreciate institutions struggling for restoring order in the province. “However, I believe a majority of those who criticise the FC are not (in favour of peace),” he added. The FC chief admitted that the situation in Balochistan is quite precarious and that the security forces alone cannot restore peace to the volatile province. “Intellectuals, opinion makers, media and political leaders have to play their role; there are several examples of other countries where these quarters (are doing so),” he said. Maj-Gen Khattak also provided a synopsis of the fluid security situation in the province over the last three months. According to him, at least 107 people, including 87 civilians and 20 security personnel, have been killed in incidents of terrorism. Gas pipelines were attacked 66 times during the year. He added that security forces had also recovered a large range of arms, ammunitions, explosive materials, mines, detonators and Improvised Explosive Devices. Published in The Express Tribune, April 1st, 2012. As you all know Khan Kalat organised a meeting of Sardars (Harbyar, Akhtar ) in London, an effort that is seen as not to squash out differences among them but to put a united front of Sardars to reduce and eliminate influence of middle class, poor Baloch in the liberation movement. Sardars want to deny any space for non Sardars in any field, the message is clear to common people, it doesn’t need a genius to understand their cruel motto. They issued a joint statement signed and endorsed by paper organizations, to show the world leaders that they are the whole and sole group representing Balochistan and key stakeholders. In the event of any negotiations with Poki establishment or world bodies, Sardars will be on the table and we the common Baloch and middle class leaders and fighters and families who shed blood for their mother land will be denied a chair. For Sardars common middle class, educated baloch is a threat to their control. We must counter sardars at any cost by appraising world leaders about cruel past. We repeat again, these Sardars are coming together and joining hands for their own interests, not out of love for Baloch people and Balochistan. This is purely to control and squeeze Balochistan’s mineral resources and make money. Khan Kalat want to sell Gawadhar port to pustoons as per our sources, therefore we appeal to all common Baloch people to teach a lesson. President of Baloch Society of North America pointed out in a email group that “Some of these orgs listed below, such as Baloch Liberation Movement, Balochistan United Front-IF, Balochistan Liberation Organisation and International Voice for Baloch Missing Persons are fake and #2 number Kaghazi (paper) organizations which we never heard about before. Beside BNP, BHRC and BRP, the rest are Iranian pro-federation small groups. We caution world leaders to be watchfull about these fake groups and selfish Baloch Sardars and not to fall in trap. The real people who are fighting for freedom are living in abject conditions in Balochistan with their sons and relatives thrown in jain and collecting bullet ridden bodies daily. While tese sardars are shouting slogans of freedom and independence in european capitals, their own family members are part of Pakistani establishment and singing songs of United Pakistan. These Sardars are playing double game. Baloch welcome US intervention at 19th Session of Human Rights Council of the United Nation’s in Geneva, to support Baloch concerns over deteriorating human rights situation in Balochistan.On 14th of March 2012 at the 19th Session of Human Rights Council in Geneva Mr Mehran Baluch and Ms Nina Petek of World Environment and Resource Council made and read their interventions on appalling human rights situation in Balochistan. Khair Baux Marri’s gatekeeper is ISI man. When any visitor from Balochistan visits his house in defence area the gatekeeper takes all information and pass on to ISI office over phone. People at ISI office cross check the visitors information and takes decision whether to allow the visitor to let in or not. In most of the cases we learned from relatives that agencies simply pick that person and make them disappear. Many Bugti tribe members and fighters have disappeared after visiting Khair Baux Marri. DO NOT VISIT KHAIR BAUX MARRI’S HOME IN KARACHI. The question is whether Khair Baux Marri know that his gatekeeper is a ISI man. This is just another instance to prove that Khair Baux Marri and his sons are hand in glove with ISI and Pakistani establishment. 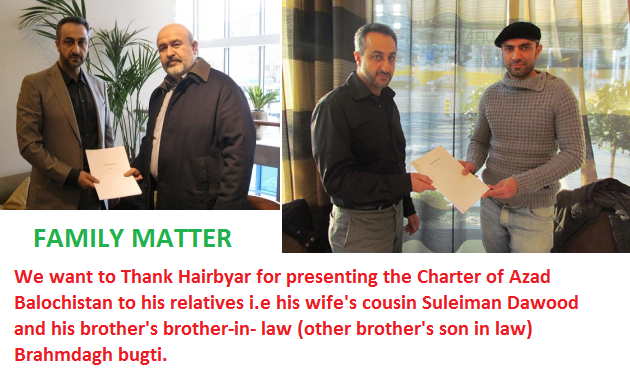 Pokistani Government and ISI are nether scared of KB family nor Mengal family, the only man they are scared of is Brahmdag Bugti who is currently in Switzerland. Remember, My dear common Baloch brothers, these Sardars control all fronts- Freedom Movement, Political Parties, Socio-economic. We are used as pawns in their grate game, never trust these Sardars, having said that, we appeal you all to come forward and take charge of leadership for transformation of our lives. Our only weapon to accomplish this is 3 things- Education, Education, and Education. FIGHT NOW TO OPPOSE THESE OPPORTUNIST SARDARS AND NAWABS.